I’m not much of a soup maker in the “traditional” sense, anyway. I have given up on trying to make soups from scratch with bones. My mother- and sister-in-law make awesome turkey soups and chicken soup, but I’ve never been able to master this skill, so I’m okay with that. 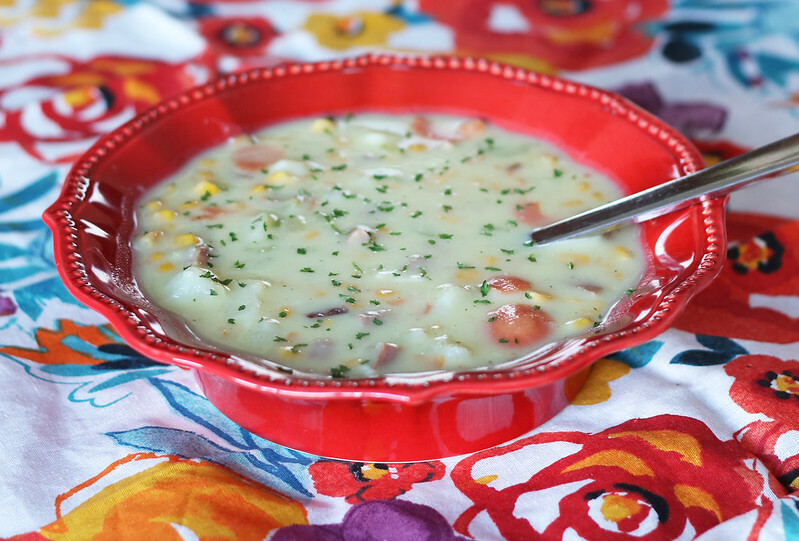 However, I can do a mean potato-based soup and this ham and potato soup is warm and hearty and tasty all the same! In a stockpot, combine potatoes, celery, carrots, onions, corn and ham, cover with water (or chicken broth) and cook over medium heat until the potatoes are tender, about 10-15 minutes. Stir in the chicken bouillon and add in salt and pepper. In a medium saucepan, melt the butter over medium heat and then whisk in flour, stirring constantly until thick. Slowly stir in milk, not allowing lumps to form, until all the milk is added to make a roux. Continue stirring over medium head until thick and boiling, about 5 minutes, and continue stirring for 1 minute. Stir the roux into the stockpot and cook the soup until heated through. May serve immediately or refrigerate the soup for later. In a stockpot, combine potatoes, celery, carrots, onions, corn and ham, cover with water (or chicken broth) and cook over medium heat until the potatoes are tender, about 10-15 minutes. Stir in the chicken bouillon (if you used water) and add in salt and pepper. It always amazes me how much the chicken bouillon and ham give it such an amazing flavour, and that this soup doesn’t need any additional spices. It’s an awesome way to use up leftover ham. This soup is very versatile, you can certainly leave out any of the veggies that you don’t like or add others that you do like. 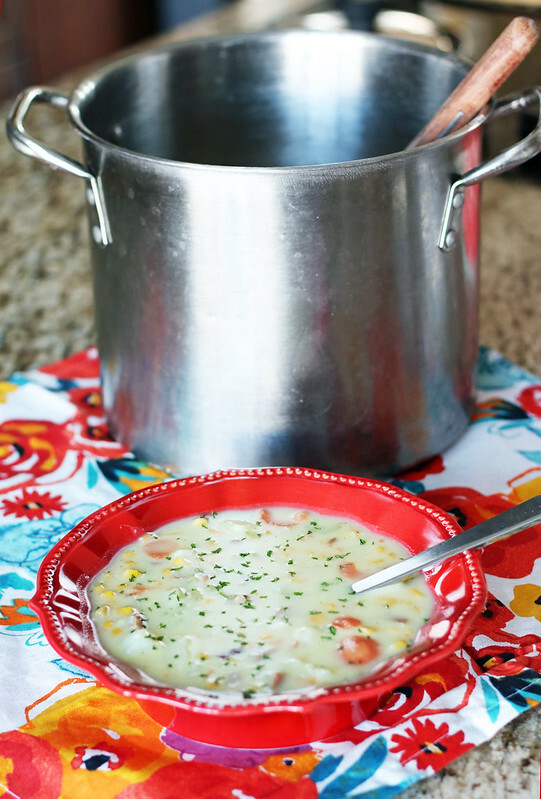 Hope you enjoy this ham and potato soup! « Pediatric Migraines & Chiropractic | Does It Really Help?